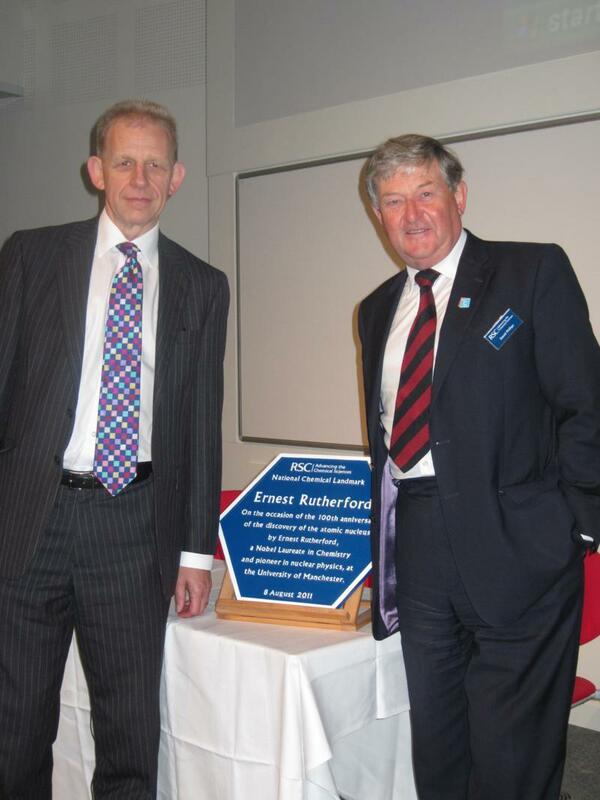 The Landmark Plaque was presented to Prof Rod Coombs, Deputy Vice-Chancellor of Manchester University by RSC President Prof David Phillips. Photograph by Diana Leitch. The presentation took place in the Conference Centre, University Place, Manchester University on Monday 8th August 2011 as the opening part of the Rutherford Centennial Conference organised by the Institute of Physics to celebrate the centenary of the publication of Rutherford’s paper describing the discovery of the atomic nucleus. The conference marked one hundred years of the atomic nucleus by addressing the wide range of current topics characterising modern nuclear physics, including nuclear structure and astrophysics, hadron structure and spectroscopy, weak interactions and relativistic heavy-ion collisions. The historical aspects of his discovery were dealt with as part of the RSC’s Landmark event. The conference itself was opened by Mr Derek Leask, High Commissioner for New Zealand, an appropriate choice given that Ernest Rutherford was a New Zealander by birth and lived there until he took up his postgraduate studentship in the Cavendish Laboratory, Cambridge, in 1895. Jeff Hughes of Manchester University gave an address outlining Rutherford’s life and scientific achievements. This was an amplification of his talk which he gave to our Group in March 2011 as part of our Mme Curie conference. Rutherford was appointed Macdonald Professor of Physics at McGill University, Montreal, Canada in 1898 where he quickly became an authority on the new science of radioactivity. In 1907 he moved to Manchester University and in 1908 he was awarded the Nobel Prize in Chemistry for his McGill work on radioactive decay. As he regarded himself primarily as a physicist, he remarked that this was the greatest transformation in his career! At Manchester, Rutherford and co-worker Hans Geiger, together with their student Ernest Marsden, used α-particles to bombard gold foil. They observed an unexpected back-scattering of the particles and this led Rutherford to propose his theory of the nuclear atom. The results upon which his theory was based were, in fact, published in 1909 but it was at a meeting of the Manchester Literary and Philosophical Society on 7th March 1911 that his conclusions as to the nature of the atom with its nuclear “core” were given a public airing. The hypothesis was given a mathematical interpretation by Niels Bohr in 1913 into its now familiar form. The second speaker was John Schiffer, emeritus professor at the University of Chicago who spoke on the development of nuclear physics post-Rutherford. This proved an ambitious aim for what was a lecture of less than an hour’s duration, but John managed valiantly and not only drew attention to the other landmarks that map out this field but also found time to speculate which of the current researches might be identified as the most promising ones. Ernest Rutherford on the occasion of the 100th anniversary of the discovery of the atomic nucleus by Ernest Rutherford, a Nobel Laureate in Chemistry and pioneer in nuclear physics, at the University of Manchester. Prof Sean Freeman, of the Nuclear Physics Research Group School at the University of Manchester said: “It is a real pleasure for the Royal Society of Chemistry to be involved in the celebrations of the centenary of Rutherford’s discovery of the atomic nucleus. “His genius uncovered the structure of the atom and effectively initiated the whole area of nuclear physics. It is particularly nice for the RSC to join us in the opening ceremony of the conference as Rutherford won the Nobel Prize for Chemistry ‘for his investigations into the disintegration of the elements and the chemistry of radioactive substances’. The University is particularly proud to receive a Chemical Landmark plaque to mark this anniversary”. This entry was posted in England, Europe, United Kingdom and tagged blue plaque, chemistry, manchester, physics by Alan Dronsfield. Bookmark the permalink. Professor Alan Dronsfield is chair of the Royal Society of Chemistry Historical Group.